ዋነኛው ጦርነት ሊካሄድበት ሲገባ ዘግይቶ እና በመጠኑ በተጀመረበት በአፍጋኒስታንም ንፁሐን ሰዎች በየቀኑ ሕይወታቸውን እያጡ ነው፤ ሕጻናት እና ሴቶች ሰለባዎች ሆነዋል። አክራሪዎቹ ሰፊ የአደንዛዥ ዕጽ ማሳዎችን በማዘጋጀት፣ ዕፁን በማስፋፋት እና ገንዘባቸውን በመሰብሰብ እጥፍ ድርብ ወንጀል ሲሰሩ ቆይተዋል። የዚህ ሁሉ ግንባር ቀደም ምልክት እና መሪ ደግሞ ቢን ላደን ነበር። ይህ ላለፉት 10 ዓመታት ሲፈለግ የነበረ ቁጥር አንድ ወንጀለኛ የሚገባውን አግኝቷል። ግን የእርሱ መሞት ምን ዓይነት ለውጥ ያመጣ ይሆን? congratulation to the winner this is real great victory if it is right. i am doubting why such kind once happened and it was wrong the death of him. i don`t think that he is died.It is fake foto which is developed by soft ware. 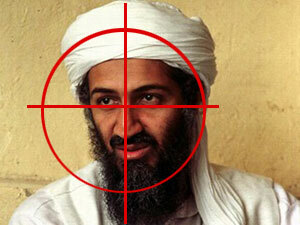 fake photo mean not Bin Laden alive. Yes, the world is a better place now than 2 days ago since we have got rid of someone who believes in terror and has the blood of 3000+ innocent citzens. Now as monumental as this news may be, I do not believe it fulfills the goal you set for the blog. Deje Selam has come to be a trusted source for information regarding our Church and to continue to do so, it needs a commitment from the editors to stick on its stated path. what is the story of yeakaki Binladen pls tell tell the whole story ye Awassaw. Thanks. I also request the one who commented from Awassa to tell us "what the Akika binladen is, I think u mean the " Ye hawultu sir kumartegna" is going to be assinged in Awassa? We, the Awassa Christians, are suffering with the devilish people attack. Even they are more cruel than Osama Bin laden. They are going to destroy our church. Please, wake up !!!! The Patriarch is playing the leading role on this distractive action. God, please save us from evil doers!!!! Bin Laden's largest terrorist team is still in Somalia. So Alshebab is not wishing Ethiopian church to see in any corner of the Glob.So why some of us are very surprised when Deje selam writes about one savage non-sense man if we call him ''man'' callen Osama Bin Laden. He must have another million death.Thanks to God.He has dieddddddddddddddd!!!!!! We mourn the loss of thousands of precious lives, but we will not rejoice in the death of one, not even an enemy. Returning hate for hate multiplies hate, adding deeper darkness to a night already devoid of stars. Darkness cannot drive out darkness: only light can do that. Hate cannot drive out hate: only love can do that. Especially we, christians, should not rejoice in the death of one because our religion and Bible don't support that.But most of the comments I read on this blog are contradicting this. Esey Biladen Enkuwan moteke! Gine anten yeweledeh yealem melekam yalehonew asetesaseb kehone Ante kedemeh bememoteh azenalehu yeteweledekew gine selam lemadeferse kehone bewnet enkuan moteke! You better clean yourself up from other Christian bin Ladens who believe in killing others to realize their wish and dream. Bin Laden received his punishment for his atrocity; other mini bin ladens will also be punished by God as well. We need to understand any form of militancy is not right. The Holy Gospel does not tell us to kill others to pursue our agenda. We are ordered to be compassionate and to preach the Holy Gospel that can change the lives of people with the Love of Lord Christ Jesus. this topic nothing to do with dejeselam.let us focus on our agenda. ke wustachin sint ashebariwoc alu bete chrstianin yemigezegizu.bemaymeleketen neger talka angiba.kewanaw guday endanzenaga. please please deje selam don't forget your mission!!! We are now expecting you to give the current situations of our church. For instance, those blamed preachers are now doing rediculus things in differnt corners of the country that needs immidiate response. It ia by far better to give a concrete informations that the curch followers must know at this especial event.